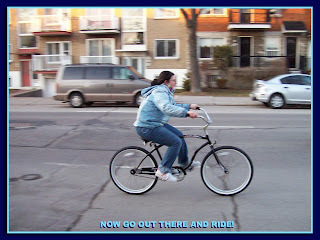 A while back, Sue from justbicycles.com contacted me to add some of my articles to their website. I went over to check things out and found a no frills website and blog about selling bicycles online. Being a cruiser bike maniac myself, I was happy to see that they had a nice selection of cruisers, even a tandem, among the other regular bikes. The prices were also very decent. So you might have noticed the banner for them at the bottom of this blog for a while. I figured that it would be more to the point than some Linux banner. Anyways, I was going through their online bicycle catalog and I found this bike, The Chief. It was on sale at $140, shipping to Canada was $65, with duties and exchange rate, the total is a bit over $CDN300. Not bad considering that we don't have too many cruisers around these parts and the price for something like this would be a lot more. The bike was shipped with Fedex and I received it within 7 days. The bike was very well packed and the only loose thing the box was the seat, but it was very well protected for the trip. I have pulled hundreds of bikes fresh out of the box while working for stores and bicycle shops and this one was very much up to standard. To be fair and find out if it was easy to assemble, I enlisted my daughter to take on the job. Now Sarah is not unfamiliar with bike maintenance, I have taught her well. But she never had the chance to assemble a brand new bike together. Don't think for a minute that I gave her the job just because she's a girl. Sarah can tune a bike, flip a boy bigger than her over her head and she sword fights with the toughest of them in Live Role Playing. The first thing to do is to get that bike out of the wrapper and get your tools ready. You'll need a set of Allen keys, a 15mm socket wrench for the wheel, a 15mm open ended wrench and/or an adjustable open ended wrench. Cut the tie wraps holding every thing together and remove the wrapping paper over the frame by hand. The only thing to watch for while unpacking the bike is the front wheel. It is slipped into the left crank arm and you must slide it out carefully. 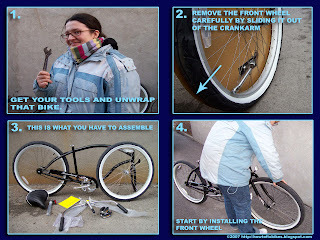 Install the front wheel and pull out the kickstand so you can work easily for the rest of the assembly. 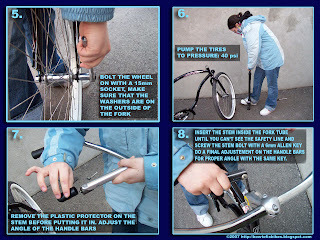 Align the front wheel properly and make sure that the washers are between the nut and fork. Tighten the nuts with a 15mm socket wrench. Now pump both tires to the indicated tire pressure, in this case 40 psi. Moving to the handlebars, remove the protective plastic cap on the stem and adjust the bars temporarily by unscrewing the 2 top Allen bolts. The bar is shipped that way to save on space. Insert the stem inside the fork tube until you can't see the safety line on the stem. Align it with the front wheel and screw it in hard. Now you can adjust the angle of the handlebars to your preferred position permanently. Now insert the seat tube inside the frame and lock it in by screwing in the Allen bolt. Install the seat, adjust it to be level with the ground and tighten the nut with an open ended wrench. 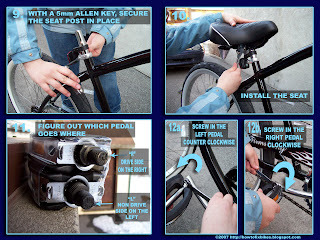 To adjust the height of the seat, you will have to install the pedals first with a 15mm open ended wrench. Make sure you don't mix them up! On the pedals, you will find a stamped "R" or "L". Left and Right, with right being on the side of the chain drive. The reason this is important, is that the left side pedal is reversed thread. This means you have to go counterclockwise to screw it in. After installing the pedals, you can now adjust the height of the seat by making sure that with your heel on one pedal, your leg is straight while sitting down on the seat. Check out this article for a complete explanation. For a review of this bike, check out this post.